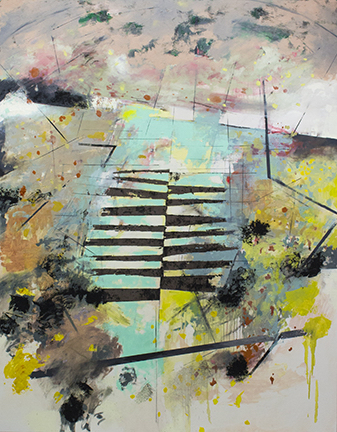 The Helzer Gallery is pleased to present the dynamic, large-scale works of Seattle-based artist Kyle Cook. Kyle Cook’s paintings exist somewhere between pure abstraction and hints of a world that we know, or at least begin to recognize. Cook’s paintings are neither strict abstraction nor wholly non-objective. His investigation of the landscape through drawing informs an intuitive painting process which non-objectively builds paintings that begin to reference ideas of landscape and environment. The result is a painting that points us to these ideas with the urgency and energy of inhabiting our contemporary environment, and thepower and complexity that the land naturally possesses. The luscious surfaces of Cook’s paintings invite a closer viewing. Embedded into many of these oil paintings are chunks of ground rubber and strips of reflective glass beads such as are used to illuminate road markings at night, adding another layer of meaning to these visually tantalizing works.